14/09/2017 - The French economy is expanding, the labour market is recovering – albeit gradually - while productivity and the standard of living remain generally high, according to a new OECD report. It adds that further reforms are now needed to maintain current levels of social protection, boost jobs and ensure that public finances are sustainable. The latest OECD Economic Survey of France says the economy is now expected to grow by 1.7 percent in 2017, an upward revision from the OECD’s 1.3 percent forecast in June and the highest rate for six years. Thanks to an effective social protection system and the minimum wage, poverty is lower than in most other OECD countries, although it remains highly concentrated in certain neighbourhoods where residents suffer from multiple disadvantages, including discrimination in the job market. 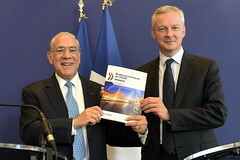 The Survey, presented in Paris by OECD Secretary-General Angel Gurría and French Minister of Economy and Finance Bruno Le Maire, identifies priority areas for future action. They include reforms to make taxes more favourable to job creation and high productivity, a more inclusive labour market and the need to improve lives in poor and marginalised neighbourhoods. The Survey says too many low skilled people are unable to get jobs while sharp inequalities in educational outcomes hinder social mobility. It recommends simplifying the complex training scheme system and developing apprenticeships in vocational lycées by encouraging businesses to take on young trainees. The Survey also suggests better incentives in terms of pay and career prospects for excellent teachers working with pupils from disadvantaged backgrounds and a stronger focus on innovative pedagogical practices to identify and address learning difficulties and meet different needs of students learning in the same classroom. In order to promote jobs and productivity, labour laws need to give businesses and their workers more flexibility to negotiate working conditions and wages, according to the Survey. Welcoming the Government’s planned labour reforms, Mr Gurría said it was “crucial” for firms and workers to be able to adapt working conditions to their specific needs. “The right balance needs to be found between an inclusive labour market guaranteeing strong worker protection and representation, and one which is flexible enough to allow businesses to innovate and compete,” Mr Gurría said. The Survey points out that, at 56.4 percent of GDP in 2016, France has the highest public spending of any OECD country, which requires a tax burden with heavy economic and social costs. A long-term strategy is needed to reduce public expenditure, ensure debt sustainability and make room for further tax cuts and a simpler tax system, while safeguarding a high level of social protection. This, says the OECD, would help job creation and investment. Efforts to reduce labour tax rates on low wages and on capital income are particularly important. Broadening the tax base, by removing tax breaks on capital income, and giving a bigger role to the progressive personal income tax with fewer exemptions, can provide financing for this, as can higher green taxes. But lowering high public spending will also be needed. The public payroll is more significant than in in other countries with strong social protection and pension spending is also too high and fragmented, says the report. Moving towards a single pension system, as planned by the Government, would improve labour mobility and lower management costs. The Survey argues for a gradual increase in the minimum retirement age in line with life expectancy. Rising healthcare spending can be better controlled by improving coordination between healthcare providers, in particular for chronic diseases, and strengthening their role in prevention, says the report. In a special chapter on deprived neighbourhoods, the Survey suggests that targeted investment in transport and housing infrastructure as well as education and training could go a long way to improving economic opportunities and well-being. An Overview of the Economic Survey, with the main conclusions, is accessible at: http://www.oecd.org/economy/surveys/economic-survey-france.htm.